I used to be that guy who, after a beautifully orchestrated agency presentation, would ask my agency team, “Great, so what’s the anticipated ROI?” I was caught between the necessity of finding hard numbers to report and the knowledge that you can’t place a value on a creative concept or media plan. As a marketing guy with a large packaged goods company, I was under all kinds of pressure to “show the value.” I hated it. To my mind, good creative and solid execution goes a long way. And 10 years ago, proving ROI wasn’t what it is today with most brands. Technology has added transparency to the mix, and hence, made accountability not just possible, but expected. And while the marketing landscape has become increasingly complex and difficult to navigate, what is abundantly clear, is that there remains a disconnect between what brands expect and what agencies deliver. The agency business is tough: Falling margins, clients demanding more for less, and a steady churn of talent coming and going. If that wasn’t bad enough, there is a disturbing trend taking place, whereby brands are bringing agency functions in-house (at an alarming rate!). 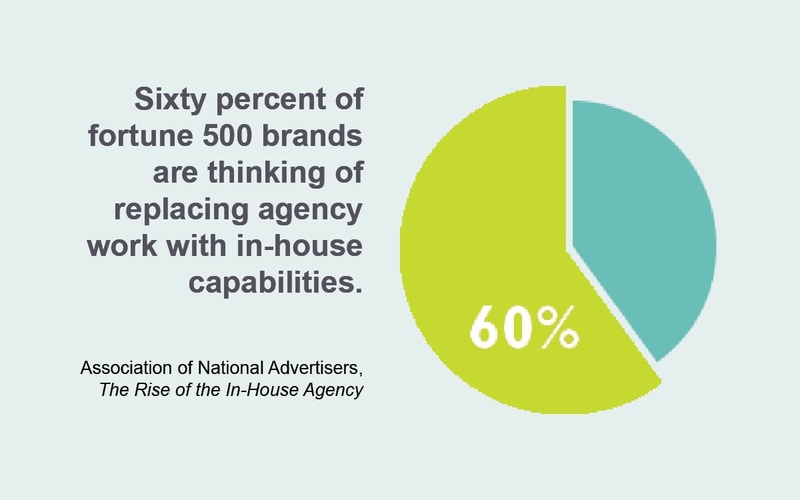 According to a survey by the Association of National Advertisers, 60 percent of fortune 500 brands are thinking about replacing agency work with in-house capabilities. Much of the shift is being driven by the need for greater cost efficiencies, increased quality control, and quicker turnaround times. 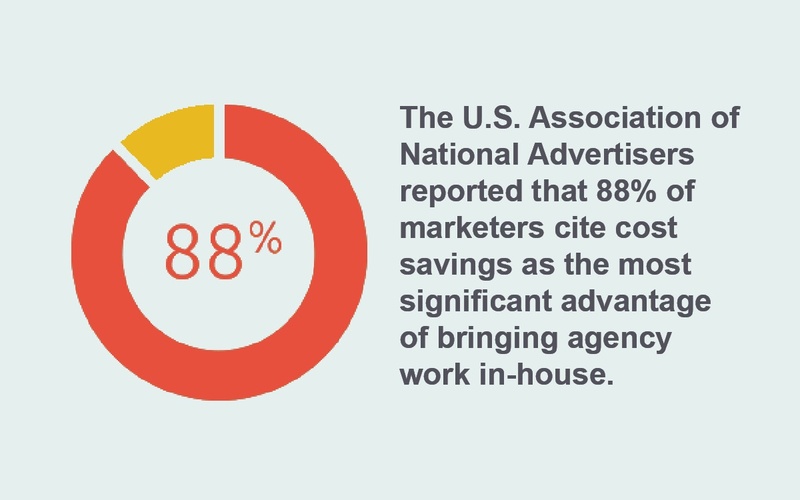 The U.S. Association of National Advertisers reported that 88% of marketers cite cost savings as the most significant advantage of bringing agency work in-house. While technology has made things faster and cheaper, a lot of these savings have not been passed along, making the case for big agency overhead harder and harder to justify. With the increased importance that mobile and social data play in driving consumer insights, more and more brands are looking for data ownership, putting the agency’s role in question. Marketing is in real-time, the agency isn’t. In-house agencies can turn on a dime and are closer to the internal brand groups and key decision makers. Hip-shot reactions to replace agencies with in-house teams could prove to be a mistake (or a CMO’s crowning moment); but what is clear, is that for agencies to succeed, they need to embrace new business models and become more accountable to the bottom line. Making ads, buying media and building websites will not sustain the agencies of the future. And while the debate continues as to what this new model looks like, there is little doubt that the answer lies somewhere at a common intersect point – data. According to a recent survey between Deloitte and the ICA, two-thirds of marketers expect ROI data from agencies to determine spend going forward. As part of this movement, we should expect to see vanity metrics take a back seat to data that is both actionable and directly aligned with specific business objectives. To succeed in the future, agencies must embrace real-time data, practice accountable creative, and be technology agnostic. For those equipped to deal with data, there is a growing opportunity to tie their work to hard business metrics – and help their clients close-the-loop between marketing and sales. To succeed however, a new relationship between agency and client is required. In this new model, the ad-tech partner, agency and CMO will share the same dashboard view of real-time performance, each stakeholder gleaning data through their own lens. Through open data environments, marketers will mine data to form insights that will power all marketing initiatives, across all channels. Such a strategy can help differentiate their products, services and customer experiences. While it is not clear yet how the agency model will evolve, one thing is for certain: the need for increased accountability will push toward the emergence of new business models. Marketers who aren’t asking fundamental questions about the roles of (and fit between) agencies and internal marketing teams stand the risk of being left behind. Let us know your thoughts in our comment section below. Do you believe agencies that adopt data have a competitive edge against in-house agencies?